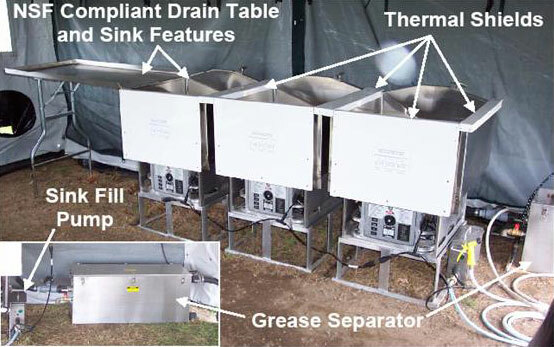 Improves safety and cleanliness during washing and sanitizing field kitchen utensils. Outdoor Venture's Field Sanitation Center greatly improves the cleanliness and safety related to washing grease-laden food preparation utensils. Consists of three Stainless Steel sinks with water temperatures controlled to 110°F, 120°F and 170°F. Heated with three Modern Burner Units (diesel/JP-8 fuel fired for safety). Operable at temperatures from -25° to +120°F. Sized for easy setup/packout by two personnel in less than 15 minutes.